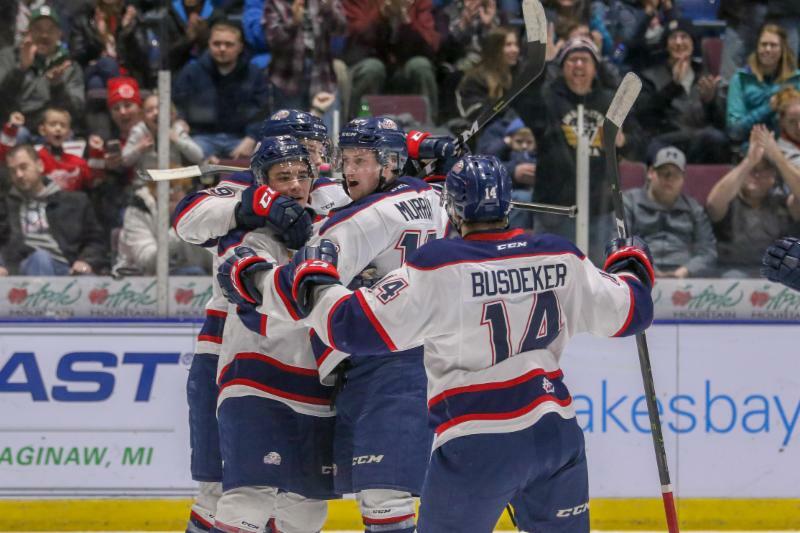 Saginaw, MI – The Saginaw Spirit open a four-game home stand Saturday evening with a 6-3 victory over the CHL’s third ranked London Knights at The Dow. Saginaw is still just two points behind the Sault Ste. Marie Greyhounds for the West Division lead. Owen Tippett and Damien Giroux lead the Spirit offensive attack with two goals each. Saginaw Spirit goaltender Ivan Prosvetov makes 55 saves for his 26th victory of the season. Saginaw and London traded scoring chances early in the first period. Arizona Coyotes prospect Prosvetov and Vegas Golden Knights prospect Jordan Kooy came up big for their team and matched each other save-for-save. It took until the 14:07 mark of the first period for the Spirit to break the scoreless tie. Minnesota Wild prospect Giroux’s sharp angle shot ricocheted off a London player and slid into the net for his 21st goal of the season. It was the second consecutive game with a goal from the Spirit captain. Just 46 seconds later, the Spirit’s Reagan O’Grady would extend the lead to two-goals with a great individual effort for his seventh goal of the season. The overage defenseman skated out from the left-corner and made a nice deke to wrap the puck around the goaltender Kooy. The Knights got on the board with overager Kevin Hancock’s 40th goal of the season. Las Vegas Golden Knights prospect Paul Cotter dropped the puck off to Hancock at the point. The London center drifted down to the top of the left-circle and snapped a shot past Prosvetov top shelf. Saginaw regained a two-goal lead in the waning seconds of the first period with Florida Panthers prospect Tippett’s 23rd goal of the season. Detroit Red Wings prospect Brady Gilmour intercepted an outlet pass from a Knights defenseman and quickly sent a pass over to Tippett at the top of the slot. The right-winger faked a slapshot and sniped a quick wrist shot top-shelf over the goaltender’s shoulder. The 2017 Florida Panthers 10th overall pick extended his point streak to three games with the goal. 2018 Columbus Blue Jackets first round pick Liam Foudy cut the lead to one just 47 seconds into the second period. After Prosvetov made a nice save on Hancock off a two-on-one rush, Foudy sent the rebound that bounced off a Saginaw defenders skate into the net for his 29thgoal this season. The Spirit controlled the play for much of the second period with several opportunities to extend their lead. Kooy made an amazing desperation save to snag the puck off Cole Perfetti’s wrist shot while the Knights goaltender was on his back. The middle of the second period was very physical where the teams got very heated. London’s William Lochead got tangled up with Prosvetov after the whistle and was ejected for spearing the Spirit net-minder. Saginaw’s Gilmour notched his 10th of the season with less than four minutes remaining in the period off a great passing play. Rookie defenseman Mason Millman rifled a pass to a streaking Perfetti to the left of the goal. Perfetti redirected the puck to the top of the crease where Gilmour hammered the puck into the wide-open London goal. With the goal, the Saginaw’s alternate captain passed Jordan Kea for 19th all-time among Spirit players with 52 career goals. Perfetti, a Saginaw Spirit 2018 first round pick, extended his point-streak to six-games with the assist. Saginaw outshot London, 19-13 in the second frame after they controlled much of the play. The Spirit net-minder Prosvetov came up clutch in the third period after two London man-power advantages in close succession. The Russian goaltender made 31 saves on 32 shots in the third period of play alone. Saginaw extended their lead immediately after the Spirit killed the second London power play with an end-to-end goal by Giroux. The Hammer, Ontario native took the puck wide around the Knights defenders and cut into the front of the net. Giroux patiently skated around Kooy and stuffed the puck into the net for his second goal of the game. After the Spirit killed off the front end of a London five-on-three man-power advantage. The Knights converted on the second half of the penalty when Detroit Red Wings prospect Alex Regula poked the puck into the net after Prosvetov stopped the Knights original shot. Just 47 seconds later, a hooking call on a breakaway attempt from Tippett resulted in a penalty shot opportunity for the Saginaw right-winger. Tippett converted on the penalty shot with a perfect wrist shot from the middle face-off hashmarks to give the Spirit a 6-3 lead to finish the game. With the victory, the Spirit picked up their 20th victory of the season at The Dow Event Center. The most since the 2013-14 season (20). The Saginaw Spirit bring in the in-state rival Flint Firebirds Wednesday, February 13 for Arts, Hearts, and Spirit Night presented by The Saginaw Art Museum. There will be a McMath Painting Presentation prior to the game in the Budweiser Red Room beginning at 5:30 p.m. Following the game, The Budweiser Red Room will host an McMath Painting Auction. It is the final meeting of the season between the West Division foes as the Spirit will look to remain perfect against the Firebirds. Saginaw has been victorious in the past nine straight against Flint and collected points in 16 straight outings. Watch live on OHLlive.com or listen live on the flagship WSGW 100.5 FM Talk and Sports and fmtalk1005.com with Joey Battaino and Dennis Desrosiers on the call. “Countdown to Faceoff” with host Domenic Papa starts 15 minutes prior to puck drop.